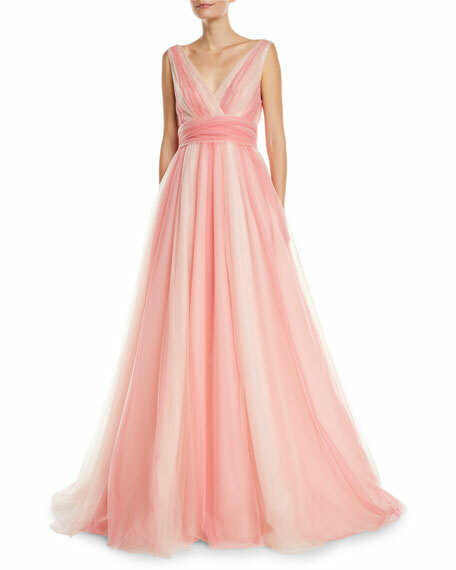 Carolina Herrera gown in two-tone ombre tulle. Belted waist ties at back. 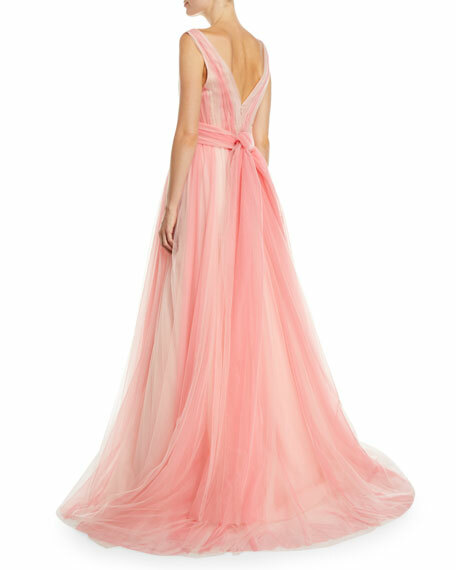 Aidan Mattox evening gown with allover beading. Approx. 58"L down center back. V neckline. Short flutter sleeves. A-line silhouette. Floor-length hem. Hidden back zip. Knit polyester. Polyblend lining. Spot clean. Imported. Model's measurements: Height 5'11"/180cm, bust 31"/79cm, waist 23"/58cm, hips 34.5"/87cm, dress size US 0/2. Aidan Mattox short-sleeve beaded gown. Approx. 59"L down center back. Deep V neckline. Short sleeves. Contrast trim and waist. A-line silhouette. Hidden back zip. Floor-length hem. Polyester self/lining. Spot clean. Imported. Model's measurements: Height 5'10"/177cm, bust 33"/84cm, waist 25.6"/65.2cm, hips 35.8"/91cm, dress size US 2-4/FR 34-36.